Welcome to my Music Diary – today for the 8th November! On the 8th November 1971 one of the most legendary LPs in Rock history was released: The fourth studio album by Led Zeppelin, simply titled „IV„, hit the stores. It’s also called „Four Symbols„, „The Fourth Album“ or „Led Zeppelin IV“. Although nothing is printed on the cover, neither title nor band name and no picture of the group or members is featured on the artwork, „Led Zeppelin IV“ has been sold over 37 million copies worldwide and with a 23-times platinum certification by the Recording Industry Association of America, it’s after Michael Jackson’s „Thriller“ the second-best-selling album in the USA ever. The eight songs were recorded between December 1970 and March 1971 at several locations and produced by guitarist Jimmy Page. Many of the songs became classics in Rock history – like „Black Dog„, „Rock and Roll“ and „Stairway to Heaven„. Welcome to my Music Diary – today for the 2nd November! Happy birthday to Mr. Dave „Peggy“ Pegg, who was born on the 2nd November 1947 in Birmingham, UK. The English mulit-instrumentalist is best known for his playing with the legendary Folk band Fairport Convention and his contribution as a bass player for Jethro Tull from 1979 until 1995. At the age of 14 years he started to play the guitar and he was also member of the school band at Yardley Grammar School. In the sixties he worked with severeal Birmingham groups like „The Crawdaddys“ and „The Roy Everett Blues Band“. In 1966 he failed to become the guitar player for a band called The Uglys (featuring Steve Gibbons), but he took the chance to be a member as the bass player – so he switched the instruments. One year later Pegg formed the Blues trio „The Exception“ with singer Alan Eastwood and Roger Hill on guitar. During that time Dave also played with Robert Plant and John Bonham, with whom he played in the band „The Way of Life“. In 1967 Dave Pegg joined the Ian Campbell Folk Group, where he also learned to play the mandolin. Two years later he began to play with a group called „The Beast“ (featuring Cozy Powell and Dave Clempson). Exactly on his 22nd birthday he received a telephone call by Dave Swarbrick from Fairport Convention and was asked if he would like to join the band, because of the departing of Ashley Hutchings, who was going to found the Folk-Rock group Steeleye Span (feat. Maddy Prior). And in July 1970 the first Fairport Convention album feat. Dave Pegg on bass was released: „Full House„. Until the break up in 1979 Dave Pegg recorded nine studio albums with Fairport Convention. In 1979 David Pegg was asked by Ian Anderson to join Jethro Tull and to replace the ailing John Glascock. His live debut was on the 5th October 1979 for the „Stormwatch“ world tour and took place in Toronto, Canada. So for the next fifteen years Peggy was the bass player and recorded the six classic studio albums „A“ (1980), „The Broadsword and the Beast“ (1982), „Under Wraps“ (1984), „Crest of a Knave“ (1987), „Rock Island“ (1989), „Catfish Rising“ (1991) and three tracks for „Roots to Branches“ (1995). His last live performance with Jethro Tull happened on the 29th May 1994 in Basingstoke, UK. After his departure from Jethro Tull, David Pegg concentrated more on his work with Fairport Convention again. The reunion of the Folk Rock institution happened already with the album „Gladys‘ Leap“ in 1985. Welcome to my Music Diary – today for the 25th September! Back in 1980 another great musician passed away far too early: Led Zeppelin drummer John „Bonzo“ Bonham died after a heavy drinking session at the age of 32. The British musician is still considered as one of the best drummers in Rock history. 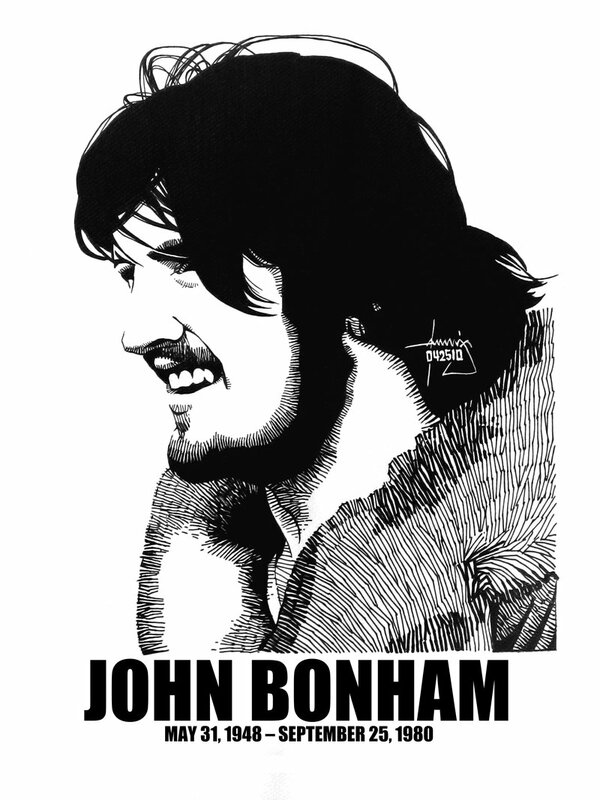 John Henry Bonham was born on the 31st May 1948 in the Redditch, Worcestershire, UK. It was obvious that Bonham should become an outstanding drummer: At the age of five he built his own drum kit of containers, cans and tins. Ten years later he get his first proper drum kit. Shortly after that the drummer joined in 1964 his first group called „Terry Webb and the Spiders“. In 1966 Bonham was a member of „A Way Of Life“ and his next stop was at the Blues band „Crawling King Snakes“, where he met Robert Plant for the first time. The singer formed afterwards his group Band Of Joy with Bonham on the drums again. Shortly after that this band called it a day. In 1968 Jimmy Page was searching for a new line up after the break-up of The Yardbirds. After recruiting Robert Plant also John Bonham became a member of the new band. Due to contract issues it was called firstly The New Yardbirds. Then John Paul Jones completed the line up and after a mini tour in Scandinavia the band changed the name into Led Zeppelin. 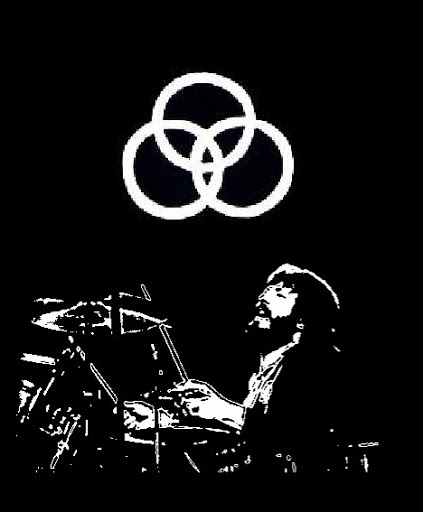 With John Bonham on the drums, Led Zeppelin recorded the legendary studio albums „Led Zeppelin“ (1969), „Led Zeppelin II“ (1969), „Led Zeppelin III“ (1970), „Led Zeppelin IV„(1971), „Houses of the Holy“ (1973), „Physical Graffiti“ (1975), „Presence“ (1976) and „In Through the Out Door“ (1979). In 1976 the live double LP set „The Song Remains the Same“ was released and in 1982 „Coda“ (a collection of unreleased tracks from 1969 until 1978) hit the record shops.